It’s easy to hear one of Walk the Moon’s seemingly made-for-Top-40 hits and write them off as just another pop sideshow. But it takes seeing them live understand why they’re the real deal. The foursome didn’t so much hit the Fillmore stage as destroy it Friday night as they whipped their face-paint-clad fans into a frenzy, barely allowing room to breathe. There’s only one adjective that can be used to describe Walk the Moon onstage: electrifying. Before racing through a set designed to make the audience “shut up and dance” (it had to be done, sorry), Bear Hands warmed up the crowd. This foursome was a great choice for opening act this go-round; they’re like a sophomore version of Walk the Moon. Bear Hands did a fantastic job engaging with the audience and set the perfect tone with their own energetic blend of ’80s electro-pop and indie rock. Once they’d wrapped, it wasn’t long before Walk the Moon made their grand entrance to the theme song from The Lion King, of course. Rarely do you see the kind of high-energy performance you see with Walk the Moon. The band is all over the place, literally, hopping around stage and dancing like mad men, taking the audience’s manic dancing energy and upping the ante even more with every song. These guys know exactly what their fans want and did a flawless job creating a setlist filled with hits old and new. From fan favorites like “Lisa Baby” and “Quesadilla” to newer releases like “Kamikaze” and “One Foot,” they did it all and never missed a beat. In fact, they did it all at breakneck speed and seemingly without tiring at all. 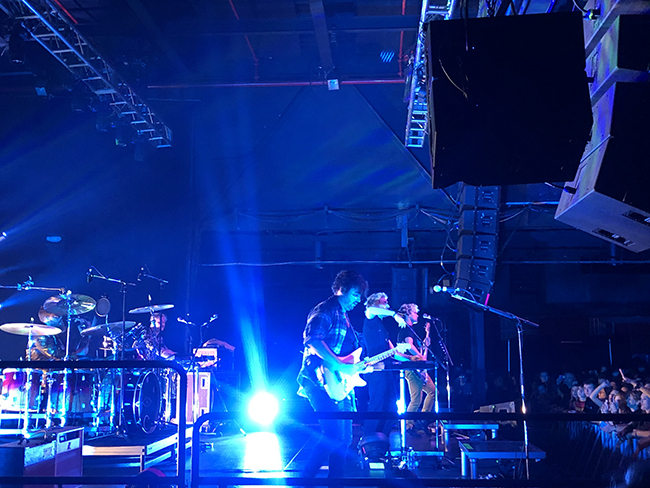 Walk the Moon, once again, gave Charlotte their all.